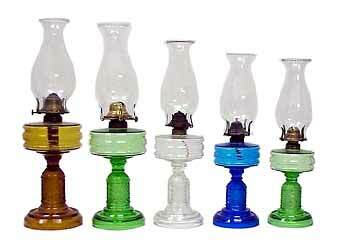 This site was created to show examples of the products of the Hemingray Glass Company. 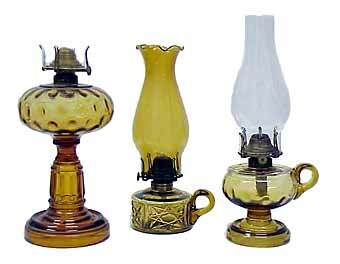 Hemingray is known for their insulators, but they also made many other items. 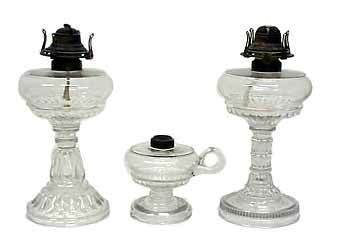 Bottles, fruit jars, kerosene lamps, tableware, and other misc. items are but a few of the items they produced. Here is a grouping of glassware made by the Hemingray Glass Co. during the 1880's. 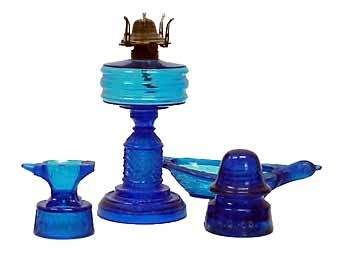 The bird dish in back was patented in 1876 and the anvil toothpick holder was patented in 1887. 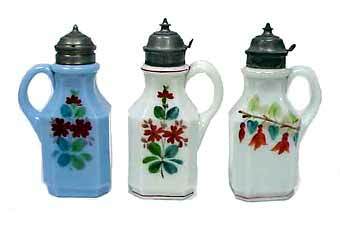 These glass syrup pitchers, called molasses cans in the 1880's, were produced by Hemingray in several colors and paint patterns. This lamp was advertised in 1888 in four sizes. As you can see, this actually. comes in five sizes. 1848-1852 Robert Hemingray & Ralph Gray are partners in Cincinnati, Ohio. 1852 Partners Robert Hemingray & Ralph Gray move their glassworks across the river from Cincinnati in Covington, KY.
1857-1860 Firm name is known as Gray, Hemingray, & Bros.
1861-1863 Firm name is known as Gray, Hemingray, & Bro. 1864-1867 After Ralph Gray's passing in 1863, the company is now known as Hemingray, Bros, & Co.
1868-1869 Firm name is known as R. Hemingray & Co.
1870 Hemingray Glass Co. is incorporated. 1888 Hemingray opens second factory in Muncie, IN. ca. 1890 Hemingray closes Covington, KY plant but continues to own property. After the disastrous fire at Muncie in 1892, this plant may have been re-opened to complete orders. At various times until about 1902 this may have occurred. 1933 Hemingray Glass Co. is sold to the Owens-Illinois Glass Co. The Muncie plant is operated as the Hemingray Division. 1967 The last Hemingray insulators are made. 1972 Owens-Illinois closes the Muncie plant. This bottle was made by Hemingray in the 1870's and 1880's. 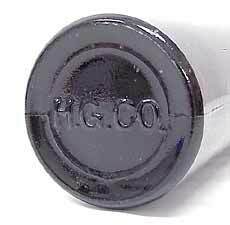 Note the heavily embossed H. G. CO. marking on the bottom.